The new spring release from Simon Say Stamp is today! I had the privilege to play with some of these new goodies and made some fun things including today's card. 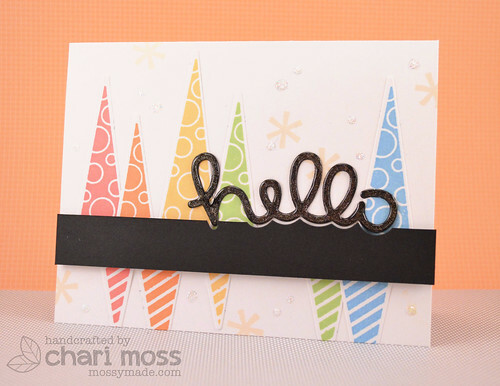 I made this card with the new stamp set Hourglass that also has a coordinating die. I stamped two of the triangle images from the set in my rainbow of inks and used the dies to cut them out. After figuring out my placement I trimmed down the images as needed to hide behind the black band. I cut the sentiment with the new Scripty Hello die from Lawn Fawn a covered it in wink of stella clear glitter then glossy accents. I stamped the asterisk images with soft vanilla shadow ink for a subtle look and added some startdust stickles accents to the background as well. Love the layout on this card...great color and design. FANTASTIC! LOVE the colors and the design with the triangles! !